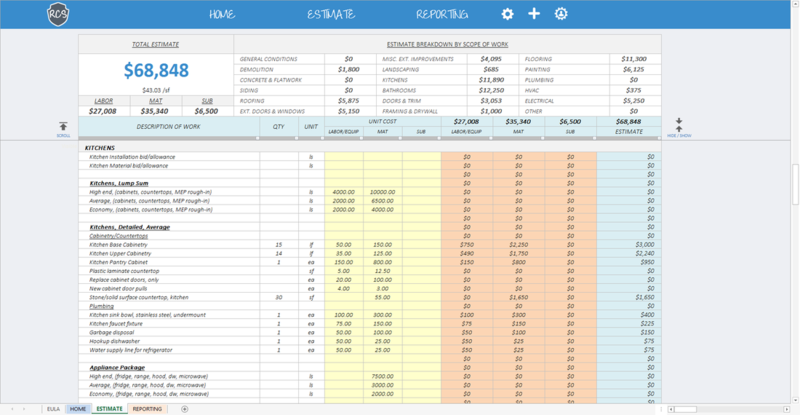 Learn about the Remodel Cost Spreadsheet tools and features and how they can be used by your remodeling business to estimate remodeling costs and create professional proposals for your clients. The Remodel Cost Sheet is broken down in to 3 areas, Estimate Setup, the Remodel Estimator & Estimate Reporting. The Project Setup sheet is where you will initially setup the project information, client information & company information which will be printed and reported on all project proposal headers & footers. 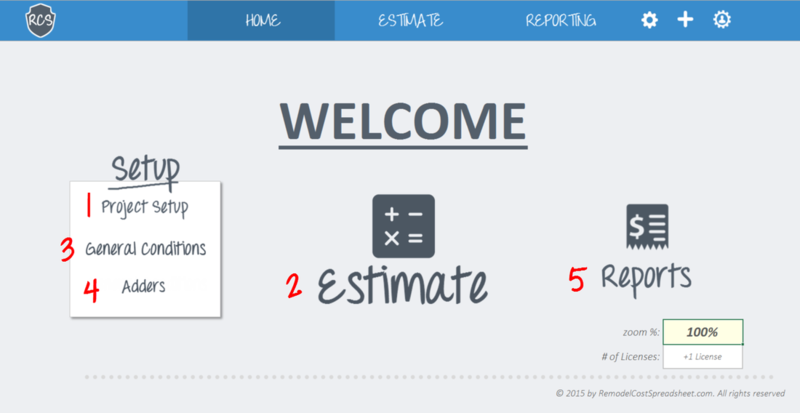 Once you setup the project on the Project Setup sheet, you can start estimating your remodeling costs using the Remodel Estimator. The Remodel Estimator is pre-built with a database of 18 common remodeling scopes of work and over 400 common work items and unit costs. To open the detailed estimate information for each section simply click the title block for the scope of work that you want to estimate, which will open the detailed estimate information. To estimate your remodeling costs you can simply input the quantity of work into the quantity column which will multiply the quantity by the unit costs and unit rates to give you the total cost for that item. The scopes of work, work items, and unit costs are all completely customizable so you can customize the spreadsheet to meet your specific project, market & business needs. Once you’ve completed your detailed construction costs estimate, you can build out your General Conditions cost estimate for project management, such as your office personnel & field personnel, as well as site requirements, temporary requirements, temporary utilities, & equipment. The next step is to setup your Project Adders or Soft Costs on the Adders Module. The Adders Module can be used calculate contingencies, warranties, insurance, overhead and profit that you want to add to the construction estimate. Use the Drop Down menu next to each item, to select how you want to calculate the adder. You can choose between a lump sum amount or a % of the construction estimate. Based upon your selection either input the lump sum $ amount or the %, which will then be used to calculate the total amount for the adder. You can then use the allocate feature to hide the adder amount from the client proposals and evenly distribute the adder the amount across the estimated construction costs. To hide or allocate an adder, simply select Yes from the Drop Down menu, which will place the costs under the Hidden column & hide the costs from the client proposals. Once you have setup and managed your project adders, you can create your client proposal documents and reports on the reporting dashboard. The Remodel Cost Spreadsheet has 4 client proposal templates which can be used to present project estimates & proposals to your clients. These client proposals give you the ability and flexibility to hide or show the project adders and soft costs from the proposals. To hide or allocated project adders and soft costs simply click the allocate adders button at the top which hide the allocated amounts from the report & evenly distribute those costs across the shown construction costs. To toggle back to the raw estimated construction costs & soft costs, simply click the ‘Show Raw Cost button which will unhide and show all of the project adders & soft costs.